Jan De Nul is set to take delivery of two China-built, 6,200dwt multipurpose sister vessels, in a bid to diversify from its traditional dredger fleet management operations. The first of the duo, Adhémar de Saint-Venant, was splashed in February, while sister ship Daniel Bernoulli will be launched on 28 April, Jan De Nul tells Ship & Boat International. Both vessels have been constructed by AVIC Weihai Shipyard Co and are fitted with dynamic positioning 2 (DP2) stations. 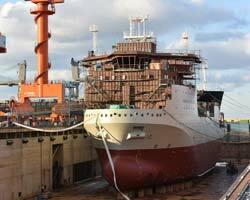 They will undertake tasks including subsea rock installation, cable and umbilical installation and subsea trenching. Each sister measures 96m x 22m and is capable of accommodating up to 60 persons and 5,100tonnes of rock. Rock installation can be conducted in one of two ways: either via excavator, conveyor belt and fall pipe, for accurate installation at up to 600m water depth; or through an inclined fall pipe, enabling secure installation against offshore structures such as “jacket platforms, gravity bases or monopile foundations," Jan De Nul says. The duo has been classed by Bureau Veritas, which granted Adhémar de Saint-Venant 'Strengthbottom' notation, in recognition of the vessel’s ability to be beached. This could open up opportunities to pitch for cable installation work in very shallow waters, Jan De Nul predicts. Each vessel’s cable turntable features a diameter of 16.8m and can handle 4,000tonnes of cable. Four diesel engines, supplied by ABC, deliver a combined output of 6,800kW per ship, while Indar has provided the electric motors required to drive each vessel’s twin 1,250kW bow thrusters and main propellers. This set-up grants each ship a speed of approximately 11.5knots. Optional equipment for these vessel types includes a work-class ROV and a 25tonne-capacity active heave-compensated deck crane.